A system offered as a smaller version of Beolab 8000. The original line-up was Beomaster 6000, Beocord 6000 and a choice of either Beogram 6000 (a radial turntable) or Beogram 6006 (a tangential drive/tangential tracking turntable fitted with an MMC 20 EN pickup). As the system developed in its role as a smaller 8000, the Beocord 6000 became Beocord 6002 when Beocord 8004 was introduced, gaining HX Pro (Beocord 6002 and 8002 were more or less the same machine). Beogram 6000 remained but Beogram 6006 was replaced by Beogram 6002, a similar looking but lesser machine which lost microprocessor control and tangential drive and was fitted with and MMC 3 pickup. There was a wide choice of loudspeakers for the system, with the MS 150s being the favoured choice. Text copyright © Beocentral. Unauthorised reproduction prohibited. When the Beomaster 8000 was withdrawn, the top line of systems was rationalised. The Beomaster 6000 now headed up the “Beosystem 8000”, which also included Beogram 8002, Beocord 8004 and a pair of Beovox S 80.2 loudspeakers. It was in this form that the system was later withdrawn. Text copyright © Beocentral. Unauthorised reproduction prohibited. 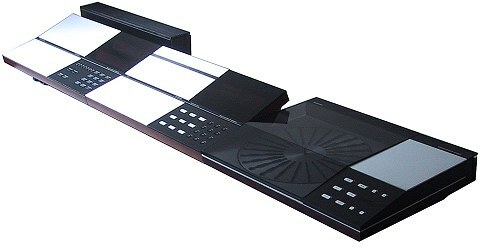 Accessories for the Beomaster 6000 based systems included a remote control terminal (Beomaster Terminal) and an adaptor that allowed a multiroom system to be used. The Beocord 9000 cassette deck was available for most of the life of the system, and was often suggested as an upgrade. Text copyright © Beocentral. Unauthorised reproduction prohibited.